Nathan originates from Londonderry, Ireland and was a showjumper before he turned flat jockey at the age of 17. He had a season to remember in 2016, riding 49 winners. Nathan has won the Scottish Sprint Handicap on Hoofalong and the Stewards Sprint Cup on Hoof It. He has also recorded multiple wins on Bosham, Gulf Of Poets, Arrowtown and Bowson Fred. Nathan is becoming a familiar name in the big races and rode out his claim when winning on Hernando Torres in July 2017. In April 2017 Nathan rode the first treble of his career at Redcar, with wins aboard Stubytuesday, Roller and Carlton Frankie. After suffering a horrific fall at Ripon in August 2017, and six months on the sidelines, Nathan returned to race riding in February 2018 and rode his 100th career winner in March. More about Nathan Evans can be seen here. 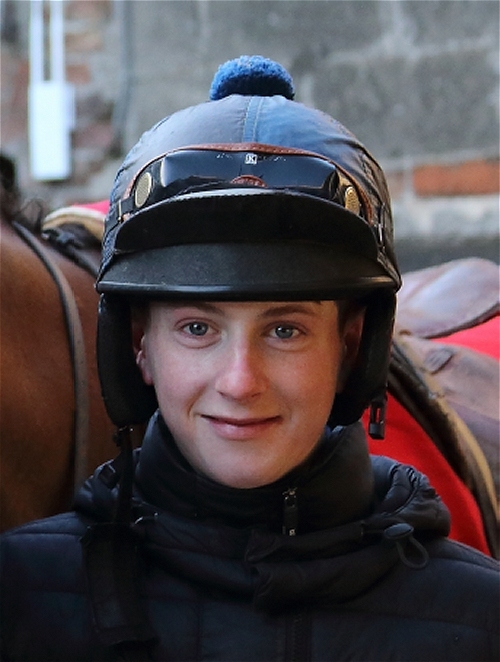 Josh recently joined us as an apprentice jockey. Josh also rides work in a morning. More about Josh Quinn can be seen here. Granddaughter of Mr Easterby, Joanna is one of the country's top amateur riders. She shared the Lady Amateur Riders championship with Serena Brotherton in 2015, both having six wins. Three of her winners were aboard Tapis Libre. In 2017 Jo won the prestigious Queen Mother's Cup at York on Tapis Libre, trained by her cousin Jacqueline Coward. The following month the same partnership won the Ladies' Derby at Epsom for the second consecutive year. You can follow Joanna Mason on Twitter by clicking the logo. More about Joanna Mason can be seen here.